This "clicker case" is a redesign of a case, also in our collection, by Robert H. Grant titled "A Strange Fish Indeed: The 'Discovery' of a Living Fossil." The case follows the story of Marjorie Courtenay-Latimer and her discovery of the coelacanth, a fish of considerable evolutionary interest. 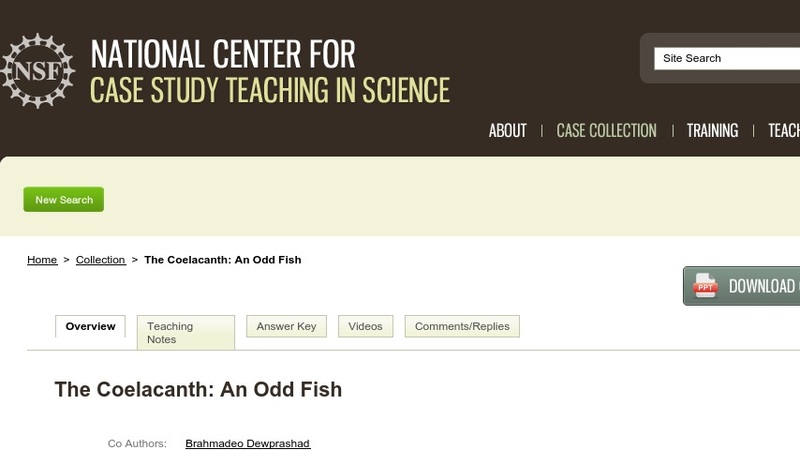 It uses the story as a springboard to explore evolutionary concepts and the scientific method. It has been reformatted to use student personal response systems (“clickers”) and a PowerPoint presentation (~4.2MB), and further emphasizes the role of Ms. Courtenay-Latimer. The case is designed for large introductory biology courses.